Sara Feldman is a student at the University of Michigan earning a Master of Public Health degree while providing care for her mother. Sara was among the more than 250 student caregivers who applied for the latest round of scholarship grants, and was chosen by a panel of senior care expert judges as one of just two winners. This is her caregiving story, submitted with her scholarship application. Who are you caring for and how are you involved as a caregiver? In December 2016 I moved my mother across the country to live with me, as the friend she was living with did not realize the level of support my mother actually needed, and was overburdened. Shortly after, my mother was diagnosed with Alzheimer’s disease. Part of me, and part of my mother as well, expected this diagnosis. Hearing these words, “Alzheimer’s disease,” however is something that hits like a thousand punches to your innermost core. I entered my second year of my Masters program grieving, worried and in crisis mode. Alongside acknowledging that I am losing more of her each day, I was also forced to evaluate how to be a student while also being a caregiver. Over the past five years, my mother’s cognitive capacity has slowly and progressively declined. Initially she forgot to file her taxes, pay the bills, close the doors to her house or car and failed to remember details of conversations. Forgetting appointments or meetings with friends became common. She misplaced things, later blaming others for taking those misplaced items. Slowly, events such as these prevented her from working. Other critical aspects reflective of her cognitive decline included leaving the stove on after cooking, putting things in odd places (like a bowl of soup in a sock drawer), becoming more socially withdrawn and being unable to initiate contact via phone or email, forgetting to close the refrigerator or freezer door and experiencing incontinence. As a result, providing care for her involves proactively thinking ahead to avoid having to reactively cope with situations and circumstances gone awry. That means I do a variety of things to ensure her wellbeing and safety. I prepare all meals, manage all bank and financial accounts, write and call her friends, arrange days for her to be with friends we’ve made in our community, close drawers after they are left open and hide medicine and household chemicals to prevent her from consuming them by accident. Creating consistent walking routes, routines, sleep schedules, eating schedules, and any routine is where she thrives. Every day, every minute, and every action is thought out to keep her safe. The most time-consuming, however, is just being there. Being with my mother is critical, and this involves time, energy and stamina. As a student, I spend my days focused on my schoolwork as she attends a day program for women with dementia. But once I walk in the door, my focus is not on studying, or completing homework. It’s being with her. Physical contact and sitting near her is comforting. Exchanging stories and engaging in conversation are critical to enable her to feel heard and connected. This is what providing care to someone with Alzheimer’s is all about. Being there. Providing comfort. Reassuring her when everything around her is changing and becoming unfamiliar. It’s rewarding, yet it carries a heavy, continual presence. Significant attention needs to be paid to quality of life and quality of care for people with dementia of diverse backgrounds in institutionalized assisted living and nursing care centers, especially given the increasing aging population as a result of the Baby Boomer generation, who are increasingly being diagnosed with Alzheimer’s and other types of dementia. As I move forward, I hope to enhance our understanding of how to improve the quality and value of care provided to adults with dementia and promote quality of life among diverse populations. One of the biggest burdens of being a caregiver is the financial hardship. 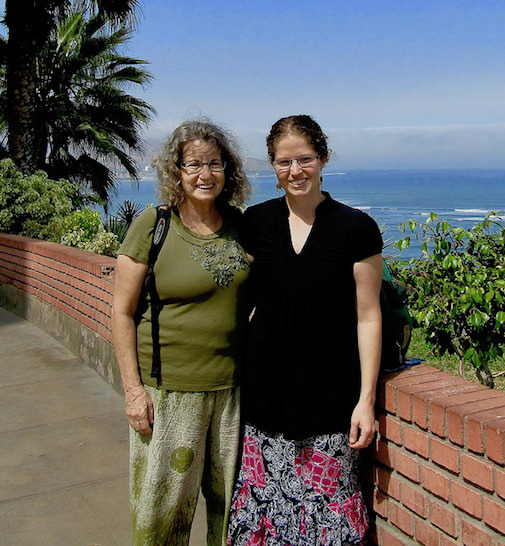 As a caregiver, it is ideal to be with my mother as much as possible. However, as a student, I also need to balance my time with earning money to pay for my books, tuition and her care when I cannot be with her. I work 20 hours per week, and this time away means more time my mother is either with members of our social network and friend group, or in her Alzheimer’s day program. Time away from my mother means increased costs when I am not there. As a graduate student making just above minimum wage for a federal work-study position, this scholarship would enable me to be with my mother more and focus more on my studies, preventing me from having to spend so many hours working and being away from her. This scholarship would be invaluable to me in helping pay for my educational expenses, and would enable me to come home and be with my mother and provide care for her, knowing that my school-related costs are not as burdensome. Furthermore, while this scholarship would help me in the immediate sense to pay for tuition and educational expenses, it would also be an investment in bettering myself as a public health advocate, an expert in dementia care and caregiving and a researcher (in the making) to improve long-term care for adults with dementia. As someone who is committed to providing the best care possible for my mother and making a difference in the lives of others, this scholarship would enable me to be more successful, knowing I was supported along the way. This caregiving story has been lightly edited for clarity and length.